Godspeed John McCain. The Real Deal. A Patriot. Where have you gone John McCain? Our nation turns its lonely eyes to you. 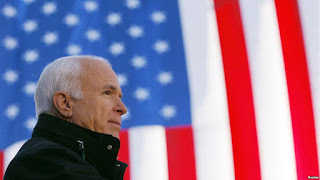 A story: near the close of the 2008 campaign for the Presidency of the United States, Republican nominee Senator John McCain faced a moment of truth and courage, one I'll never, ever forget witnessing. It all unfolded a decade ago on the stage of a rally in Minnesota. With a little more than a month to go before election day, McCain was behind in the polls and struggling to make up lost ground. Context: ten years ago the fact that an African-American, for the very first time ever, had a very good chance of winning the highest office in the land: this heartened many but also threatened and scared many voters too. Folks who looked with suspicion upon that candidate's exotic sounding name--"Barack Hussein Obama"!? Others, including a publicity seeking businessman and developer from New York City, who insisted Obama might be foreign born, maybe even a Muslim. In that historic campaign McCain could have easily jumped on the fear mongering train. Stoked the ugly whisper campaign against Obama. Presidential politics are often marked by such Machiavellian tactics. To win at all costs, right? But that was not candidate McCain. A decorated Vietnam War veteran and a prisoner of war for six years in a North Vietnamese cell: he endured torture and starvation. McCain was a person of honor, integrity and above all, courage. Not a saint. He could be tough and blunt. He made frequent mistakes but usually took immediate responsibility for his sins. His conservative politics were certainly not my cup of tea, but always I was so impressed by the political courage he showed in his life as a public servant for so many years. When McCain was confronted with political hypocrisy or deception, with political buffoonery or grandstanding, he named it for what it was. He did not suffer fools lightly. He was a maverick until the day he died. And so at that town meeting style campaign event on October 11th, 2008, McCain could have gone low. Played dirty. Used fear to garner votes. Smeared Obama. Been a bully or a braggart. A voter stood up and said to McCain: "Frankly we're scared of an Obama Presidency. (Applause). McCain responded: "First of all I want to be president of the United States and obviously I do not want Senator Obama to be. But I have to tell you, he is a decent person and a person that you do not have to be scared (of) as...President." (Boos and hisses). A second voter pushed back: "I can't trust Obama...I have read about him. He's an Arab." McCain quickly took back the microphone and said: "No. No Ma'am. He's a decent family man and citizen that I just happen to have disagreements with on fundamental issues and that's what this campaign is all about." McCain's honorable defense of Obama did not win him many fans among the party faithful. In doing the decent thing McCain that day no doubt angered conspiracy minded "birthers" who still insisted that Obama was born on foreign shores, was maybe even an "Arab". But McCain, in that one shining moment, showed courage, as a man not willing to give up his personal integrity for the sake of winning an election. Such courage was the hallmark of his career. He actually worked across the aisle with Democrats like that liberal lion Ted Kennedy to pass legislation. He put country before party, the common good before a narrow partisan good. He was a patriot in the deepest sense, beyond the pseudo patriotism of flag lapel pins and public posturing. McCain was the real deal. And yes, as a country, we will surely miss him. Godspeed John McCain. Thank you for your service. "So where are you going on vacation this summer?" a well meaning friend asked me not long ago. "Columbus, Ohio!" I replied with enthusiasm. "It's my yearly summer road trip. This August it's 765 miles from here to there. I can't wait to go and just explore." "But...Columbus, Ohio?! Why?" she persisted. "Because I've never been there." I replied. That's really the only reason I need to travel: because I've yet to visit some part of God's Creation. Explore it. Learn more about its history. 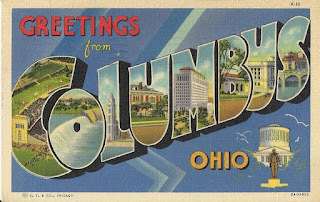 Discover what makes a place like Columbus a very special place, one of kind, home to so many. 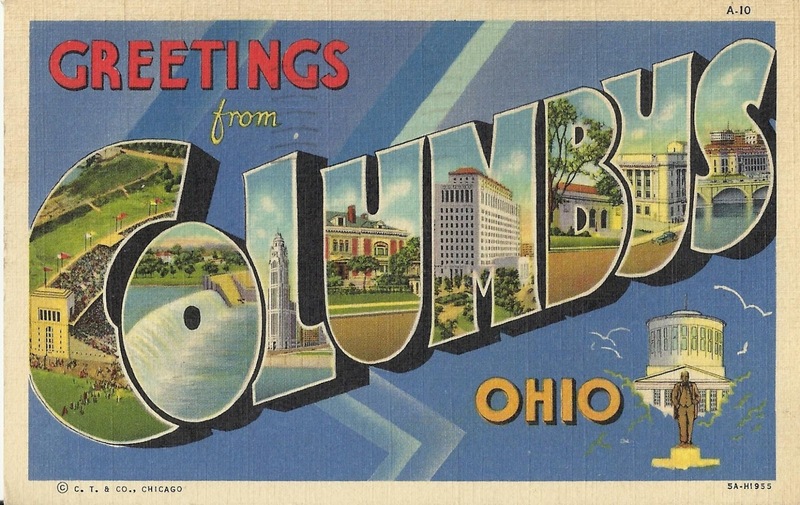 So some of my destinations on this trip have included, yes, Columbus: capitol of Ohio, home to minor league baseball and the Clippers, who play in a gorgeous downtown stadium. Cheap tickets, tasty hot dogs and "Play ball!". And Akron, Ohio, where Alcoholics Anonymous was born in a quaint guest house on the grounds of a local tire magnate's estate. Two struggling drunks shared a cup of coffee there in 1935 and together they discovered the miracle of recovery for millions of people. And Seneca Falls, New York, where in 1848 the first Women's Rights Convention was held. Participants, including Elizabeth Cady Stanton and Fredrick Douglass, demanded that America live up to the ideal that all people are created equal, that the vote must be given to women. And the Detroit-Shoreway neighborhood of Cleveland, where a good friend of mine opens up the church he serves for community basketball, as a beacon of hospitality and non-violence in a hardscrabble urban landscape. If I hadn't detoured off the main roads, explored these off the beaten path places, away from typical tourist haunts, I'd never have discovered their unique stories. Their quirks and oddities. Their place as just one part of this amazing country and world. I wonder why more of us as tourists and vacationers, travelers and wanderers, don't go out of our ways to explore such destinations. Sure, we all want to go to the places that the millions also explore: Times Square in the Big Apple, Boston's Faneuil Hall, the strip in Las Vegas, Mount Rushmore. I've visited those places, but will I return? Not likely. One and done. Such marquee landmarks are often too crowded, too familiar, too easy to experience. Don't get me wrong. I loved Wall Drug in South Dakota and the Empire State Building and Disney World too. But when I travel I also ask the human spirit of wandering to bring me to a hole in the wall diner in Lime Springs, Iowa. Or on a long bike ride along the Lake Woebegone path in northern Minnesota. Or to the architect Frank Lloyd Wright's studio in the leafy Chicago suburb of Oak Park. And, of course, to a baseball game, anytime, anywhere! All in a quest to explore and be an explorer in life, of life. Throw out the map and toss the GPS and go off road. For when we choose to go beyond our well worn boundaries and outside of our travel comfort zones, the world changes and we change for the better too. We live in a time when too many of us spend too much energy exploring the world, virtually, all through our screens. Yet there is no substitute for face to face exploration. You have to actually be there to "be there". We also live in a time when our nation is infected with an angry spirit, fueled in part by geographic and political ignorance. Thus so called "deplorables" despise so called "over educated coastal elites" and visa versa. Imagine what might happen if we as Americans chose to explore parts of the United States that we've never seen, that we far too easily stereotype. I know this sometimes snobby northeastener has had my mind and heart opened up by leaving the familiar and getting to know folks in far away places. All you need for such adventures is a full tank of gas, a spirit of exploration and the courage to take a road less traveled. Be an explorer. I dare you! Go! Even all the way to Columbus, Ohio. Life Is a Classroom. 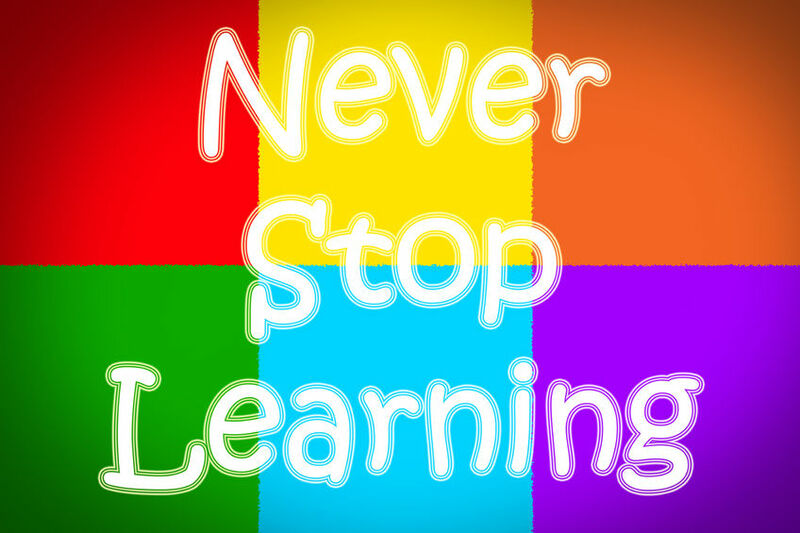 Are You Still Learning? "Here's a test to find if your mission on earth is finished. If you're alive, it isn't." --Richard Bach, "Illusions: The Adventures of Reluctant Messiah"
This time of year I always feel envious towards the young, as they prepare to go back to school, begin some new learning chapters in their blossoming lives. Late August reminds me of the excitement and anxiety, the nervous energy I always felt as a young person when brand new classes or a brand new place of study was just weeks away for me. There's no other feeling quite like it in all of life. Time for brand new books that open with a satisfying "crack" as you explore those pages of knowledge for the first time. Time for unexplored class syllabuses outlining all you will learn in the days ahead. A time when your only job in life is to learn. To expand your knowledge of the world and yourself and others. A time when life is unsettled in a good way, as you wade into some challenging new academic or life activity with absolutely no idea of how things will turn out. Life then is a blank slate, a canvas waiting to filled in, and so with courage and curiosity you move ahead. Try some new way of thinking or living. In that one bold act, your life changes for ever. What I most fear as I age is not the slow breaking down of my body, the new creaks and cracks I get to experience in the morning as I get out of bed. Nor do I fear too much this fast changing world that admittedly some days feels like a foreign land to me. Everything shifting and so quickly. No: what I fear most is my mind's ossification, the nightmare that one day I will awaken and conclude that I no longer need to learn anymore, or learn anything else, in my life. That instead I've seen it all, done it all, learned enough to last me forever. What I really need to do is fall back into my Lazy-Boy chair, watch TV all day, preferably some mindless drivel, or worst of all, a 24 hour news channel that tells me exactly just what to believe. No thought necessary. No learning. No. Give me a life of learning instead. Lifelong learning from the day I am born until the day I leave this earth. Give me a room full of books and the time to read them all, to allow those tomes to take me to places I have never been before. Give me a God who pushes me to try new things, a God who is ever faithful but always challenging me to expand my soul and never settle for narrow orthodoxy or dusty doctrine. Give me the courage to try something new each and every day. Some exotic food. To sing a new song I've never sung. Ride on my bicycle to some new place I've yet to discover. Give me a new idea I need to think about, that just may change my mind for the better. Does Anybody EVER Retire From Politics? The Cost of Leadership That Never Leaves. Some things just get better as they age, get older, rack up the years, and go gray. A vintage bottle of wine. A classic or classical song or composition, the Beatles 1970 "Let It Be", Beethoven's 1824 Ninth Symphony. Take a walk around Boston with its aged architectural and institutional wonders like the Old North Church (295 years old), or Harvard University (founded 1636) or the James Blake House in Dorchester (circa 1661) and we are reminded that good things last. There is a power and a dependability to certain things staying, remaining steady and stable. Things come and go but the best lives on. Age is a gift sometimes. It can produce great human wisdom. For investing there may be no better sage than 87 year old "Oracle of Omaha" Warren Buffet, who was already a millionaire while I was still stuffing pennies into a piggy bank. Supreme Court Justice Ruth Bader Ginsburg is no spring chicken but at the ripe age of 85 she is wise and witty and smart: a legal mind for the ages, still lifting weights at the gym while younger colleagues huff and puff. But sometimes things and people and institutions decline with age, become sclerotic, rigid, unresponsive, unwilling, unable to adapt to a new world. There's a restaurant I loved as a kid that forty years ago was the place to go for a great meal. Now when I go there I see faded carpet curled up at the edges, peeling wallpaper and a menu better suited to 1958. I expect it will close soon. Ride a Red Line subway car on the T and chances are it's up to fifty years old, creaking and clanking its way down arthritic tracks. Or consider the current state and age of our national political leadership. Lots and lots of gray hairs and dyed hairs and comb-over hairstyles in this bunch. The President clocks in at 72. House Minority Leader Nancy Pelosi is 78. Senate majority leader Mitch McConnell is 76. The retiring list goes on: Hillary Clinton soldiers on at 70, while wild and white haired Bernie Sanders whips up kids his grandchildren's age at the grand old mark of 76. Massachusetts is no younger. Senators Elizabeth Warren (69) and Ed Markey (72) bypassed AARP years ago. Democrats are so desperate for a decent Presidential candidate that they continue to pine for 75 year old Joe Biden. 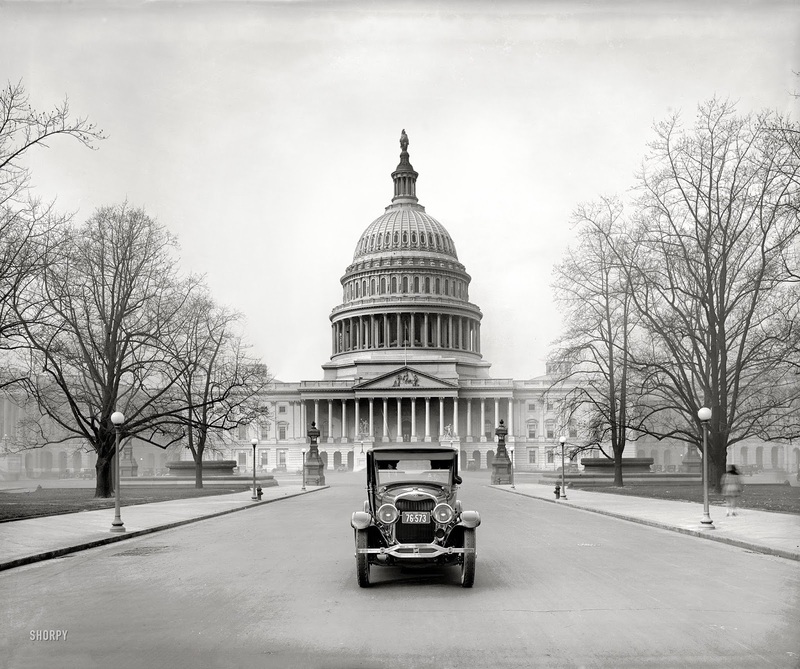 Which makes me wonder: is the current dysfunctional, gridlocked, hard headed and hard hearted state of politics in Washington D.C. caused by the scleroticism of old ideologies and old ideologues? Heck at 57, I'm a kid compared to the generation we still entrust to lead our stumbling republic. There have been times when America turned with confidence and hope to the young to lead us. John F. Kennedy captured the Oval office at 43; Barack Obama did so at 47. But lately we seem to continually vote for folks who stay and stay and stay, folks I just wish would spend more time golfing and playing bridge and less time ineffectually tackling our 2018 problems with 1968 ideas. I'm not anti senior. At the church I serve some of the most generous and committed leaders I am blessed to work with may be old of body but they are young of heart and spirit. This past weekend I rode one day and 85 miles in the Pan Mass Challenge bike ride while a teammate, more than twenty years my senior, went on the next day to ride an additional 84 miles! I know many "old" folks who are young and I know many youngsters who are much too old before their time. My faith tradition is more than 2,000 years old but it was founded by a 33 year old whippersnapper. Age is more about attitude than any numerical marker if, and when, we think young, we live young, and we continually grow: spiritually, emotionally and intellectually. 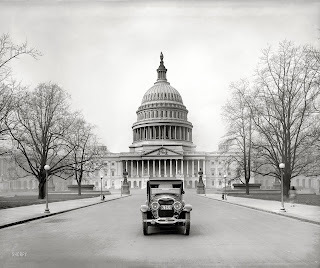 So what worries and frustrates are the aging politicians on both sides of the aisle who are more interested in a return to the "good old days" (that never really existed) rather the future, the real place we are all headed. We have too many aging politicians who think it is still the 1960's and that if you just march and sing nostalgic protest songs, everything will change. We have too many of the younger generation fleeing politics. I am not the biggest fan of 48 year old outgoing Speaker of the House Paul Ryan, but his departure, after getting caught up in the blood sport of the current administration, begs the question: just who will step up? The best actors always know when it is time to "exit, stage right". The humblest folks know when it is time to step aside and invite new leadership to lead the cause. The tired and well worn know when it is time to give it a rest and retire with gratitude. When I get to that point, I pray I will know when it is time to go. It is time for a new generation to lead us. Anybody up for a game of bridge?